Smashbox was founded by the great grandsons of Hollywood makeup legend Max Factor in 1996 (though it is now owned by Estee Lauder). Probably most lauded for its primers (of which there are several! 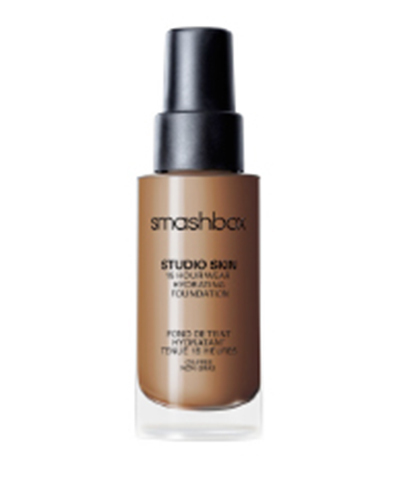 ), Smashbox’s foundations are also the HG foundation for many FleshTone faces. Studio Skin 15 Hour Wear Hydrating Foundation is a medium to full coverage long-wearing foundation. It’s one of the few foundations that will last all day, yet still feel comfortable, and it’s hydrating without being dewy. There is a reasonable selection of FleshTone hues to choose from, and in our view the hydrating foundation suits normal/oily/combination skin better than dry or mature skin. Careful application (blend, blend, blend!) and a less-is-more approach for this foundation will leave you looking flawless for at least 8 hours (not sure about 15)!